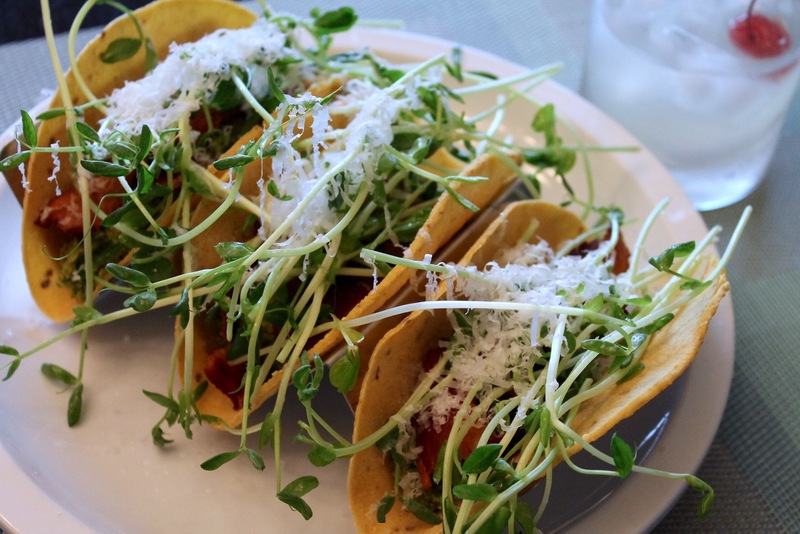 Tacos may very well be the perfect food. Of course, there's a lot of room to argue this point, but it's hard to resist a warm star filling with a spicy salsa and a few garnishes folded into an earthy warm corn or flour tortilla. It's a basic formula that allows for seemingly endless combinations. Basic, yes, but simple, not necessarily, at least not as presented in Tacos: Recipes and Provocations, the James Beard Award-nominated cookbook from Empellón chef Alex Stupak and food writer Jordana Rothman. 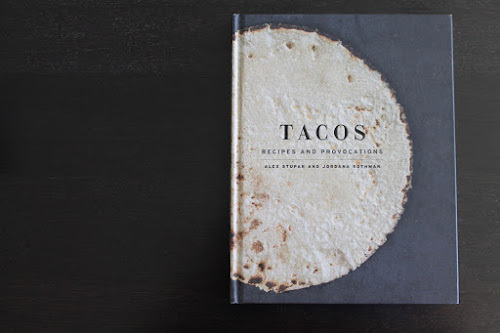 For those who view tacos as a "quick" dinner of pre-made taco shells, pre-shredded cheese and ground meat browned for 10 minutes with a pre-mixed seasoning pack, this Tacos book is not for you. For those interested in rolling up your sleeves to create sophisticated flavors with a wide variety of interesting ingredients and homemade salsas, Tacos is a eye-opening look at the potential for how the basic foundation of a taco can be expanded upon in a myriad of ways. Before I get into the tacos themselves, let's consider Stupak's interesting career for a moment. Born in Massachusetts and educated at the Culinary Institute of America, the young chef first made his name in the late 2000s as a modernist pastry chef working for Grant Achatz at Alinea in Chicago and for Wylie Dufresne at (the now defunct) WD~50 in New York, two of the most acclaimed modernist establishments in the country. That he would walk away from this in the 2010s to instead cook Mexican food--a cuisine from another country steeped in tradition for which he had no apparent experience--was a remarkable risk. But clearly it's one that has paid off. Empellón Taqueria was a success, followed by Empellón Cocina and Empellón al Pastor. I've been to two of these establishments and was particularly smitten with the fine cooking at Empellón Taqueria. Stupak addresses his amazing transformation in the book's introduction, noting that despite his Massachusetts upbringing with "Old El Paso taco nights," he later became fascinated with more authentic Mexican food while living in Chicago. With a Rick Bayless cookbook in hand, Stupak became obsessed with learning his hand at the cuisine. A trip to Los Angeles solidified his affinity for freshly made tortillas, his first of which he names as one of his three defining moments as a cook. Empellon's website defines "empellón" as meaning to "to push or jostle" and "to break through." Both are apt words for describing how the Empellón restaurants have helped elevate the status of Mexican cuisine while also allowing Stupak to reinvent his position in the restaurant world. Stupak brings this up in the introduction to explain his approach to Mexican. He's not interested in simplifying a foreign cuisine for American palates (and patience or lack thereof). So, as I mentioned above, don't go into this book expecting simplicity. You know how experienced cooks always recommend reading through a recipe first before beginning it? 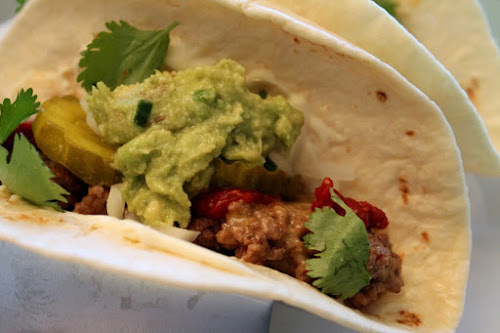 You'll definitely want to do that here, as you'll need to consider the time for making not just the taco in the recipe but also the accompanying salsa. Many of the recipes require cooking times of multiple hours. These are not recipes to break out for dinner after a full workday. I tried three of what I perceived to the book's simpler recipes, and even these were pretty involved. First I made the Chicken Tacos with Kale and Salsa Verde, a wonderful dish mad with roasted chicken thighs and a raw salsa verde that the kale is cooked in. 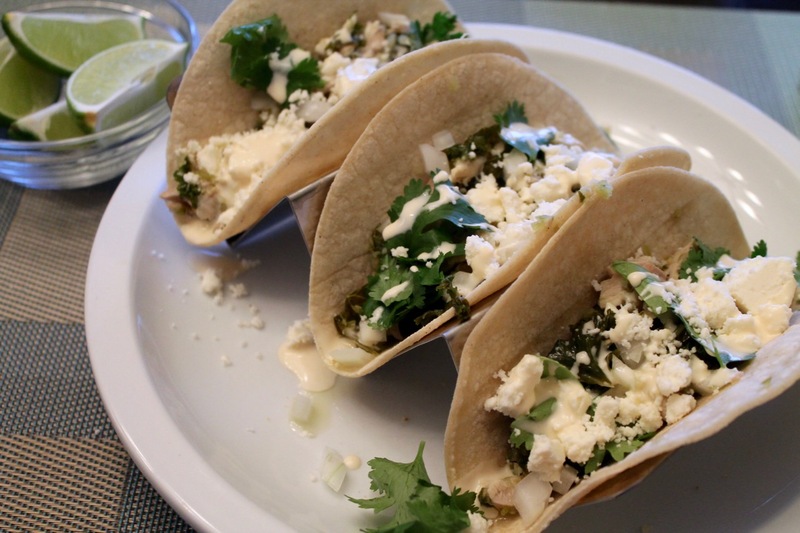 The tacos are garnished with queso fresco, diced raw onion, cilantro and lime. In total, it took me about 2 hours to make this dish, and the tacos were delicious. 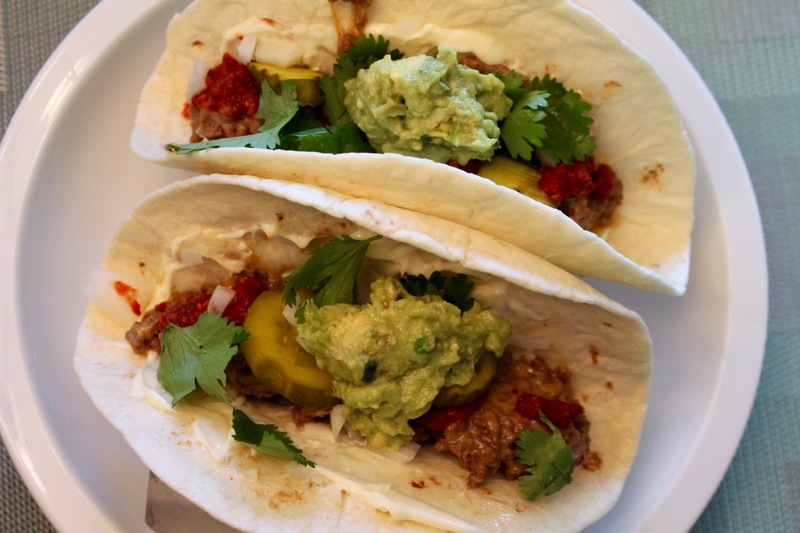 (Note that I did not make my own corn tortillas for these or any of the other tacos here. Stupak includes a recipe for them, and I have made my own tortillas in my past, but I went the store-bought route here as I could find masa marina). Next up, I tackled the cheeseburger tacos. They may sound like a bad Tex-Mex idea, but Stupak says they are actually found in Mexico City (inspired, of course, by American cheeseburgers). This one is actually doable on a weeknight, as the only cooking really is browning the ground beef and the accompanying salsa roja is not difficult to prepare. In a sense, this is the closest the book comes to those "Old El Paso" tacos Stupak references in the introduction, although I think this is far more interesting. I included my own little twist to the recipe: the addition of sweet pickles, which I think nicely offset the spicy salsa. And yes, this salsa is pretty spicy, but it's also amazingly good. The spicy-sweet salsa, which has a touch of vinegar, serves as the "ketchup" in the cheeseburger tacos. The salsa is made with dried guajillo chile peppers--10 in the book but I dialed that back to a still-quite-spicy 5. 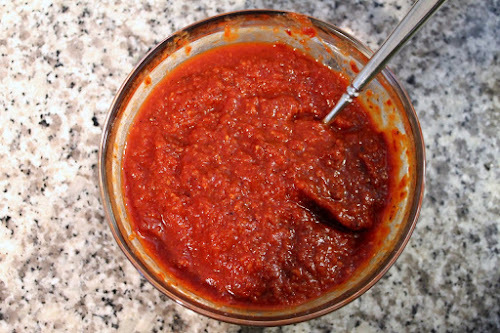 It's a tomato-based salsa that is probably the pureed red salsa marked "hot" that you see at taquerias. Unfortunately, I found an error in this recipe, but it's a simple one to fix, and I think most cooks will realize what to do. The first step involves roasting tomatoes, which are then cooled, peeled and set aside--to then never appear again in the instructions (I assume they should be added to the blender along with the soaked chiles, garlic and spices). 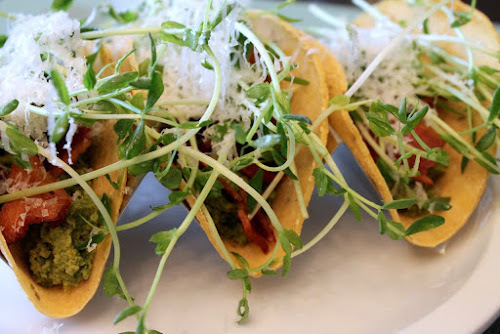 Lastly, wanting something green, I tried the Mashed Pea Tacos, which are perfect for spring. This recipe is also fairly simple and less time-intensive. The only cooking involved is blanching the peas, which are then whirled with parmesan in a food processor until smooth (I added a little water to give the choppy puree a smoother texture). Vegetarians will abhor the other change I made: I added bacon. I know, it's meant to be a vegetarian recipe, but the bacon and pea combination was really quite good here, so I don't feel any shame in suggesting it. The James Beard Book, Broadcast & Journalism Awards are tomorrow night, where Tacos will compete for the Single-Subject Book award with A Bird in the Hand: Chicken Recipes for Every Day and Every Mood by Diana Henry and Mastering Pasta: The Art and Practice of Handmade Pasta, Gnocchi, and Risotto by Marc Vetri with David Joachim. I adapted this recipe by using fewer chiles and omitting the chipotle chile in the salsa roja and substituting canned roasted tomatoes for fresh plum tomatoes. I also reduced the amount of cheese by half, substituted guacamole for sliced avocado and added sweet pickles to the tacos. 1. Heat a medium skillet over medium heat. Add the chiles and toast for about a minute. Transfer chilies to a bowl, cover with hot tap water and soak for 30 minutes. Drain chiles and chop into smaller pieces. Set aside. 2. Add the oregano and cumin seeds to the hot skillet and toast until fragrant, about 15 to 30 seconds. Remove from the pan, transfer to a spice grinder and grind into a fine powder. 3. Add the garlic cloves to the hot skillet and toast in the pan until browned in places, about 6 minutes. Remove the garlic and allow to cool, then peel the garlic cloves. 4. 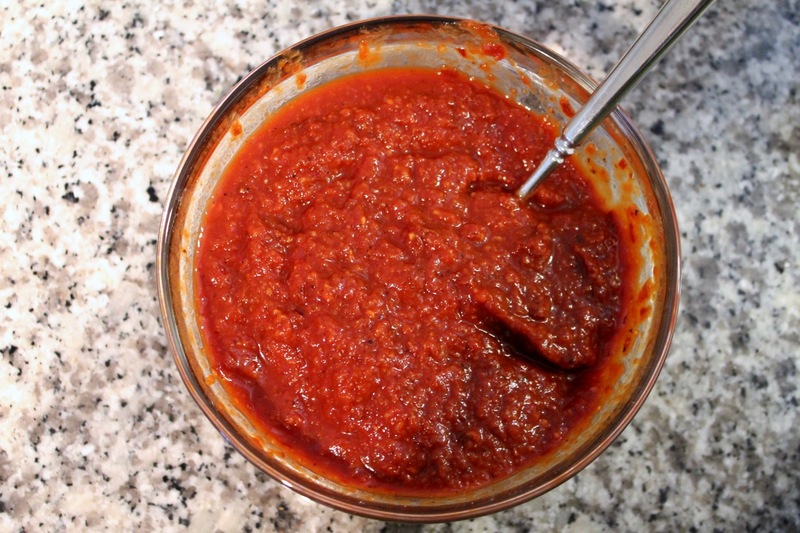 Combine the drained chiles, ground spices, garlic, tomatoes, water, salt, sugar and vinegar in a food processor. Puree until the mixture is smooth (note: the original recipe calls for straining the mixture with a fine-mesh sieve, but I kept it chunky). Transfer to a container and store in the refrigerator until ready to use (the salsa will keep for up to 3 days). 1. Heat a large nonstick skillet over medium heat. Add the beef and cook until browned, breaking up with a wooden spoon as the meat cooks, about 10 minutes. Season with salt, to taste. Add the shredded cheese and stir until the cheese is combined with the meat and melted, about 3 minutes. Remove the pan from the heat. 2. Warm the tortillas and divide among 4 plates. 3. Assemble the tacos: spread1 tbsp. of mayonnaise on each tortilla, then divide the meat-cheese mixture evenly among each tortilla. Top with a generous spoonful of salsa roja, a few slices of sweet pickles, a sprinkle of diced onion, a spoonful of guacamole and a few cilantro leaves. Note: I adapted this recipe by adding bacon and omitting freshly squeeze lime juice as a garnish. 1. Heat a medium skillet over medium heat. Add the chiles and toast, turning occasionally, until fragrant, about 30 seconds to 1 minute. Transfer chilies to a bowl, cover with hot tap water and soak for 30 minutes. Drain chiles and chop into smaller pieces. Set aside. 2. Add the bacon to the skillet and cook, turning the bacon occasionally, until the bacon is cooked through. Transfer the bacon to a paper-towel-lined plate to cool. Break the bacon into 1-inch pieces. 3. Heat about 3 inches of water to boil in a medium saucepan. Add peas and cook for about 2 minutes. Drain peas and set aside. 4. Add the chiles, peas and 1/2 cup of grated parmesan, olive oil and kosher salt to a food processor. Process until the mixture forms a smooth puree (add 1 or 2 tbsp. of water if needed to smooth it out). 5. Warm the flour tortillas and divide between two plates. Place a few tablespoons of pea puree on each taco and a handful of bacon crumbles. Top with a small handful of pea tendrils or shoots and a sprinkle of freshly grated parmesan.